Anyone who collects HK literature knows that the HK32 series in 7.62 x 39 has always existed on paper. Collectors argued that there were never really any built, at least none that had been imported into the United States. Now you know that not to be true. The example above has a serial number of 3323. But curiously, the caliber has been hand etched on the mag well, like you would expect to see on a prototype. The date reads '6/66.' Real operating guns are displayed for the first time here. These are built from the HK factory, and the fact that American Class II manufacturer Bill Fleming converted some HK91s to this caliber hardly counts from an historical perspective for the HK purist. 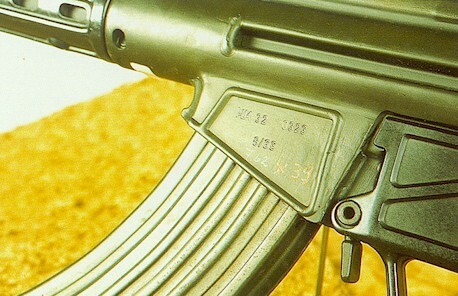 HK32KA3 that shows the unmistakable curve of the 7.62 x 39 magazine reminiscent of the AK-47 series. Prototype HK32 with flash hider cut into barrel, ventilated wooden forearm and early G3 buttstock with double rear pushpins.